The award recognizes distinguished research, professional practice, and activities that advance public understanding of gender and/or sexuality throughout the educational community. 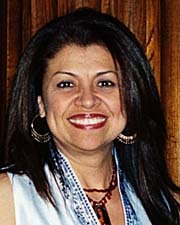 Hurtado received the award during the association's 2007 annual meeting, which took place in Chicago. Hurtado, a social psychologist, specializes in gender equity issues and has made major contributions to national and international scholarship on issues of gender and race. In her book Relating to Privilege: Three Blasphemies on Race and Feminism, Hurtado argues for a feminist paradigm that is inclusive of the concerns of all women, including women of color, and for the critical study of masculinities, as well. Her second book on feminism, Voicing Chicana Feminisms: Young Women Speak Out on Sexuality and Feminism, focused on young, educated Chicanas' views on gender issues in their communities. Her current book in progress, "Beyond Machismo: Young Latinos' Views on Sexuality, Gender, and Political Collaborations," is based on a study of 105 educated young Latino men. Hurtado, who is director of the Chicano/Latino Research Center, says her scholarship begins in the classroom, where she tries out new ideas about gender equity to see if they resonate with young students. Her interdisciplinary classes are offered to students in several departments, including feminist studies, Latin American studies, and Chicano studies. "I find that interdisciplinary exchanges are the most fruitful in deepening the study of gender equity in higher education," said Hurtado, who mentors undergraduate and graduate students, in addition to her service on dissertation committees for doctoral candidates. "It has brought me enormous satisfaction to know I have contributed in some small way to the creation of the next generation of scholars who will take the study of gender in the academy seriously," said Hurtado. As a member of numerous professional organizations, Hurtado has helped increase gender equity in higher education. She is an active member of Mujeres Activas en Letras y Cambio Social (MALCS, Women Active in Letters and Social Change), a multidisciplinary group focusing on Latina women scholars and activists, and just concluded a two-year term as chair of the National Association for Chicana and Chicano Studies, the largest organization in the United States that focuses on ethnic studies, where she brought gender issues to the forefront of the agenda. In addition, Hurtado served during the 1990s on the University of California's Latino Eligibility Task Force, which was charged with increasing the number of Latinos and Latinas in higher education. Founded in 1916, AERA is a 25,000-member professional organization devoted to advancing educational research and its practical application.